SYDNEY, Australia — An Australian newspaper has defended its decision to publish a provocative cartoon of the tennis star Serena Williams, using the image again — this time on its front page — and railing against “politically correct” critics who deemed the drawing racist. 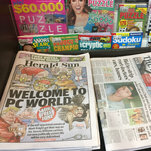 The headline “Welcome to PC World” — accompanied by caricatures of Ms. Williams, Australian politicians, President Trump and Kim Jong-un of North Korea — was displayed on the front of the print edition of Tuesday evening’s Herald Sun, owned by Rupert Murdoch. The cartoon, which mocked Ms. Williams’s behavior during last week’s U.S. Open Women’s final, drew widespread criticism from athletes, fans and public figures around the world, including the author J.K. Rowling and the rapper Nicki Minaj. Critics said the exaggerated facial features of Ms. Williams were reminiscent of racist Jim Crow-era drawings and questioned why Naomi Osaka, the U.S. Open winner, who is of Japanese and Haitian descent, was drawn with blond hair and light skin. Damon Johnston, Herald Sun editor, said on Twitter this week that Mr. Knight had the “full support of everyone” at the newspaper. Mr. Knight deactivated his Twitter account on Tuesday to stop abuse directed toward his family, according to the Herald Sun. He has countered claims of racism by referring to his other cartoons, including one of Nick Kyrgios, an Australian tennis player who is of Greek and Malaysian descent. Mr. Knight has fended off accusations of racism before, including for his depiction this year of African teenagers vandalizing a train station.